Meet the stars who will bring The Repertory Theatre of St. Louis’ lavish production of Evita to life. Running September 5–30 at the Loretto-Hilton Center for the Performing Arts and directed by Rob Ruggiero, Tim Rice and Andrew Lloyd Webber’s tour-de-force musical kicks off The Rep’s loaded 2018-2019 season. Michelle Aravena (pictured at left) stars in the title role of Eva Perón. Having appeared on Broadway in productions such as A Bronx Tale: The Musical, A Chorus Line and Jersey Boys, Aravena is a megawatt personality to match that of Argentina’s iconic first lady. Pepe Nufrio (pictured center) plays the charismatic narrator Che, whose wry commentary serves as a counterpoint to Eva’s meteoric rise. Reprising his role from Evita’s 2013 national tour, Sean MacLaughlin (pictured at right) appears as Juan Perón, the Argentinian general whose marriage to Eva propelled both to dangerous new heights of political power. Other featured members of the cast include Nicolas Dávila as the tango singer Agustín Magaldi and Shea Gomez as Juan Perón’s mistress. The rest of the ensemble features Joey Barreiro, Maria Bilbao, Nathaniel Burich, Ben Chavez, Giovanni DiGabriele, Samuel Druhora, Carmen Garcia, Esmeralda Garza (Hamlet, 2017), Samantha Gershman, Julie Hanson (Follies, 2016), Jose Luaces, Ben Nordstrom (Hamlet, 2017), April Strelinger and Tim Wessel. Director Ruggiero is well known to Rep patrons for staging numerous unforgettable productions at our theatre, including a legendary run of Stephen Sondheim’s Follies that kicked off The Rep’s 50th anniversary season in 2016. That production won seven St. Louis Theater Circle Awards, including an outstanding director honor for Ruggiero. The production team features music director/conductor Charlie Alterman, whose Broadway resume includes the Tony Award-winning 2013 revival of Pippin as well as Next to Normal. Choreographer Gustavo Zajac is a native Argentinian who has directed acclaimed tango shows in Buenos Aires and served as associate choreographer for multiple Broadway productions. The design team features several returning members from previous Rep productions directed by Ruggiero: scenic designer Luke Cantarella (Follies, 2016 – St. Louis Theater Circle Award winner), costume designer Alejo Vietti (Sunday in the Park with George, 2012 – St. Louis Theater Circle Award winner) and lighting designer John Lasiter (Follies, 2016 – St. Louis Theater Circle Award winner). Matt Kraus serves as sound designer, and Emilee Buchheit will stage manage the production. 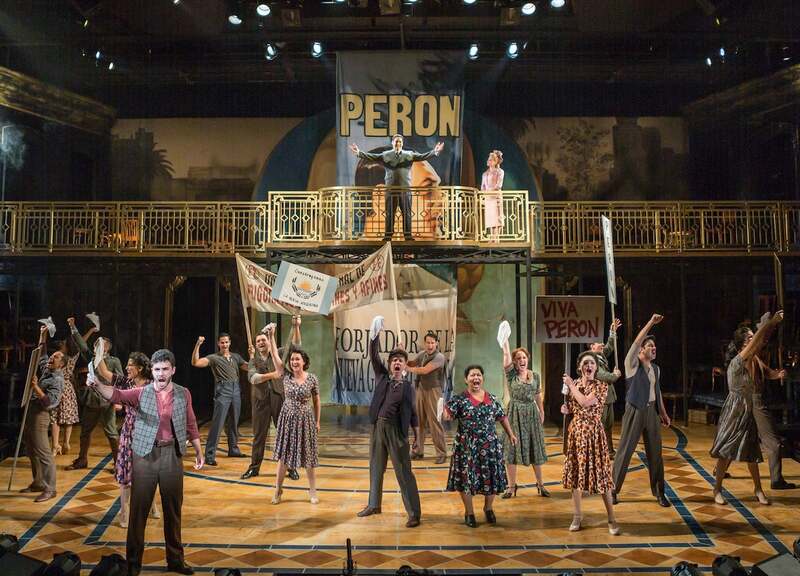 Tickets for Evita are now on sale here, by phone at 314-968-4925 or in-person at The Rep box office, located at 130 Edgar Road on the campus of Webster University. Ticket prices range from $29 to $102. Six-show Mainstage subscriptions or pick-your-own subscriptions of three-to-five Mainstage subscriptions are also available.